Q: Are some people more attractive to mosquitoes? A: Yes, certain traits can attract or repel mosquitoes. They are the sounds synonymous with an Australian barbecue: sizzling sausages, the hiss of a beer being opened, and of course, the constant slapping of flesh as an army of mosquitoes descends. But have you ever noticed that while you may be driven mad by hovering mozzies, others are completely unfazed. Is it possible mosquitoes prefer some people over others? Yes they do, says Dr Cameron Webb from Westmead Hospital's department of medical entomology in Sydney. And although the reasons behind their preferences are far from certain, it's likely to do with the chemicals in our breath and on our skin. Female mosquitoes are primarily attracted to our body heat and the carbon dioxide we breathe out, which indicate we are warm-blooded animals with the blood they need to develop fertile eggs. So the more carbon dioxide we emit, the more attractive we are to females looking for a protein hit. (Male mosquitoes don't bite). Larger people tend to emit more carbon dioxide than smaller people, as do pregnant women and those who exert themselves.This is why we are often annoyed most by mosquitoes after we play sports and are breathing heavily. Mosquitoes are also attracted to different chemicals on our skin, Webb says. "When mosquitoes get close to a person they make a decision on whether they bite or not based on essentially the smell of our skin, and that smell can vary from person to person because of different combinations of chemicals on the skin," he says. However, researchers are still uncertain which chemicals mosquitoes find attractive. Hairy arms or legs can be a physical deterrent to mosquitoes, Webb says, and the type of deodorant or perfume you wear possibly has a role in how attractive you smell to the pests. Evidence also shows wearing dark colours such as black and navy can attract mosquitoes, perhaps because they tend to trap rather than repel heat like lighter colours. It's also worth remembering that some people have a greater reaction to mosquito bites than others, making it seem as if they are being bothered more than other people. Contrary to popular belief, there is no scientific evidence that eating bananas or other foods containingvitamin B repel mosquitoes, Webb says. The gold standard insect repellent is N,N-Diethyl-m-toluamide, commonly abbreviated to DEET, which switches off the mosquitoes' desire to ingest blood. 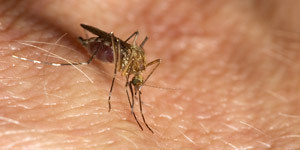 When you use DEET you will sometimes notice mosquitoes hovering but not biting. "Even the lowest doses can provide at least a couple of hours of protection against biting mosquitoes, and that's certainly two hours longer than any home remedy I am aware of," he says. Botanical products that contain citronella, eucalyptus oil or melaleuca oil do repel mosquitoes, but only for very short period of time, and you have to reapply four times as frequently as a low-dose DEET-based repellent, Webb says. Aside from leaving an uncomfortable, itchy welt, we all know that mosquitoes can spread diseases. The most common in Australia are Ross River fever and Barmah Forest virus, of which there are about 5000 to 6000 cases combined each year. Meanwhile, mosquitoes in Northern Queensland can transmit dengue fever which can make you very sick. Put fly screens on windows and doors, get rid of containers that can hold water and make sure your water tank is screened. Try to avoid going outdoors at dawn and dusk – the times mosquitoes are most active. Cover your skin to avoid exposing flesh for mosquitoes to bite. Use an insect repellent containing DEET. More information on avoiding mosquito bites can be found in the University of Sydney's repellent guidelines. If you are bitten put a cold pack on the bite to reduce inflammation and avoid scratching to reduce the risk of an infection. Dr Cameron Webb PhD is a clinical lecturer at the University of Sydney and hospital scientist at Westmead Hospital's department of medical entomology, Sydney. He spoke to Jenny Pogson.